I glance up from a sodden perch on the rail of JAM, John McPhail’s well-rigged and well-sailed J/160, as we pound into stiff westerly winds and square waves six to eight-feet (did I mention square?) 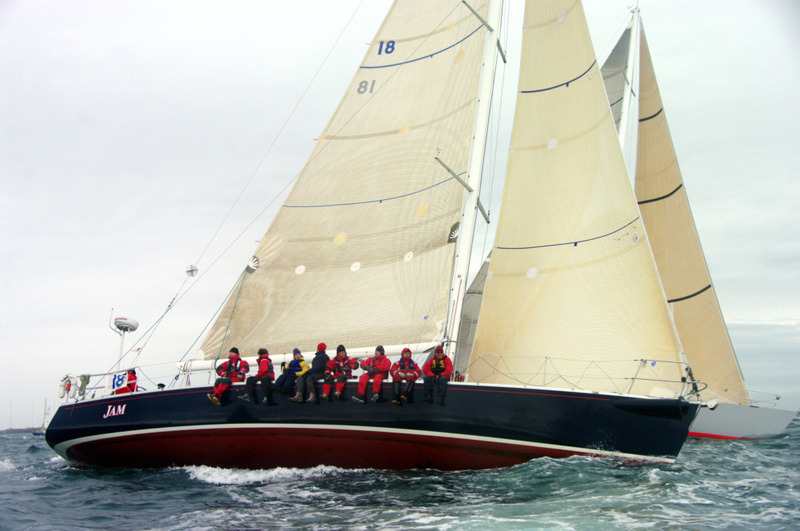 about two hours into the start of the 2010 Swiftsure International Yacht Race. This is only my second race aboard JAM, my first of any distance or importance, and I practically jump for the wheel. At the helm, I see that this is sink or swim: The seas are a cross-hatched mess of wind-against-tide, punctuated by tidal rips and boiling, evil-looking upwellings that threaten to destroy boatspeed. It’s impossible to predict wave patterns, if there are any patterns at all in this mess, so I simply drive for speed, doing my damndest to keep from plunging the bow and doing my damndest to keep from falling off the backside of a wave. The boat feels balanced, powerful, under a number three blade and a single deep reef in the big main. Controlled is a different story. Six hours later I take the wheel again, this time with a full main and a light number one. The sun has slipped to a palm’s width above the horizon, the square waves are down to gentle open-ocean rollers, and off our port bow is Neah Bay, one of the most northwestern points of the continental USA. The Straits of Juan de Fuca have relented, but the farther west we sail, the more the wind clocks to the south. Normally this would be time to say, Hallelujah!, but right here, right now, it’s a slow kiss of death: NOAA’s models predict the wind to eventually rotate to the east, giving us perhaps an hour’s worth of kite time before settling into a long, 70-mile beat back home. That’s 70 miles as the seabird flies, not 70 miles as the seaboat tacks. Looking around, our class is scattered along an east-west axis thanks to several starts and restarts. 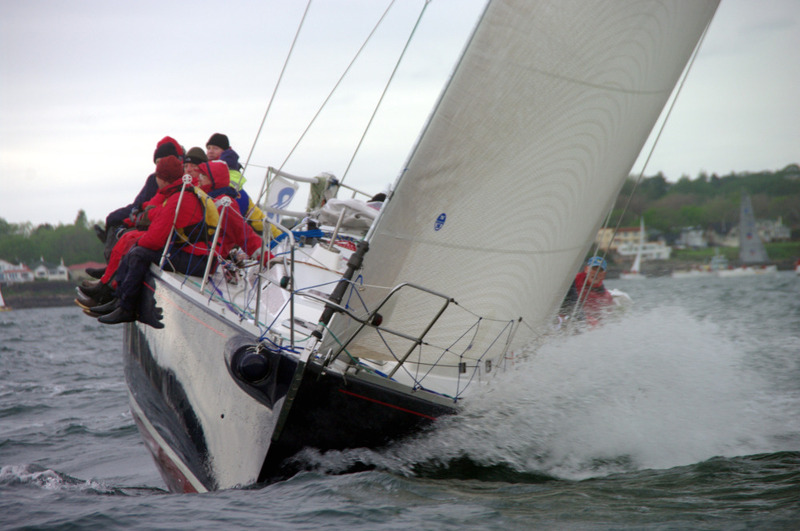 Mind you, not restarts run by the RC from the Royal Victoria Yacht Club, but restarts dictated by nature: Here in the Pacific Northwest it’s common to start racing and run into A) adverse tides, B) a no-wind zone, or C) a combination of the two. “C” is the house bet. Then, boats park up, wait for the wind or tide to relent, and wait for racing to resume. It’s a different way of sailing from what I’m used to, as an east coaster recently transplanted to Seattle. But, given the rugged topography of the wild Olympic Mountains to my left and the awesome coastline of Vancouver Island to the north, the adventurous spirit of sailing out here doesn’t take long to become addictive. Twelve hours later you can have your addiction back, thank you. We’re again near the entrance to Neah Bay, this time after rounding the lightship and making our way back to the entrance of Puget Sound. But, we ran out of quarters for the wind machine and we are parked, utterly parked. Truth to tell, we’re drifting backwards to the tune of two knots over the ground. And it’s cold — a daytime high of 47-degrees Fahrenheit — and it’s raining and it’s hard to be excited when your competition is somewhere out there in the mist and rain and all of your clothes are sodden and caffeine and sugar are not woooorking . . .
Then just like that, somebody finds a few quarters for Item C and we’re back at it. The beat goes on. Literally and figuratively. JAM slowly accelerates, her rail a few inches above the water, the current still very much foul, as we finesse our way to windward. It’s sticky sailing, but at least the GPS has modified our ETA from “Never” to “Eight hours, thirty-two minutes.” This too will change for the better as the tide swings. Moods improve, concentration and psyche return, and I drive towards hazy, cloudy points on the Vancouver shoreline, or the American shoreline, depending on the board. Some of our competition plays close to the beach, sniffing for a positive eddy, but aboard JAM our strategy is to stay in the breeze and keep our sails filled. We carefully thread the needle through the bricks, clipping along at 11+ SOG (amazing, given the light breeze). Finally, Victoria appears on the northeastern horizon, tempting us with thoughts of hot showers and the curry buffet at the regal Empress Hotel (N.B., put this on your to-do list after your next Swiftsure. The hot mango chutney is worth suffering for). Minutes stretch…then stretch some more. I keep reminding myself that the Swiftsure is the quintessential PNW yacht race, but after sailing upwind for 30+ hours, food and warmth are more appealing than living in the moment. Buddhist serenity be hanged. What’s the sound of one hand clapping? What’s the sound of one stomach growling? And just like that we cross the finish line, an unceremonious whistle blows, sails are flaked, the boat is tidied up, and our adventure is a wrap. Dock talk is rife with news: sixty-plus boats dropped out of the race, two boats were dismasted, and plenty of crews suffered rough nights. Our ride on JAM quickly starts sounding better. And better. Especially the part where we actually finished. And by the time the first spoonful of hot curry and cold beer finds my palate, I realize why the Swiftsure is iconic, a classic. By morning, I’m contemplating next year’s race, my mind aglow with fond memories of the good times: driving by a full moon and stars, contemplating my new friendships aboard JAM. Such is ocean racing: yesterday’s misery becomes today’s golden-hued memory.